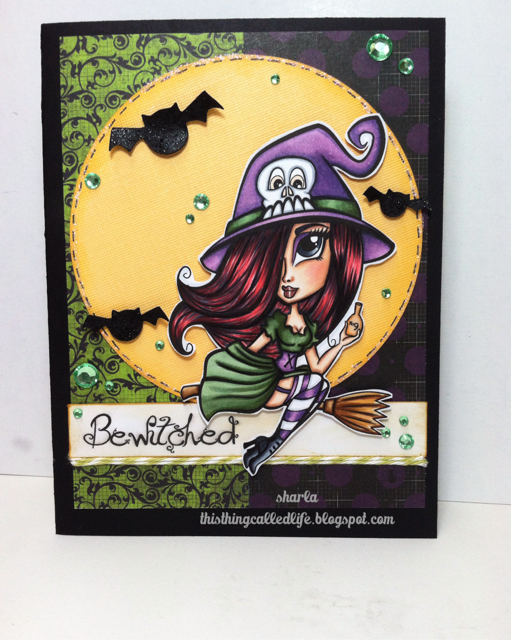 Just wanted to share this card using an awesome image from Simply B Stamps called Witchy Mrs Boo, she was the image I used for the Kit and Clowder coloring party a couple weeks back and just got her put on a card. I used a sketch from Sketch Saturday and colored with copics, used pattern paper from Bo Bunny's Fright Delight 6x6 pad, cut out bats from an SVG file from Miss Kate Cuttables and then covered them with black glitter glue. Your coloring is amazing. I love her! Thank you for Linking Up at PDE Linky Party. Your colouring is gorgeous, Sharla - I love this card! What a cute little witch!!! Thanks for joining us at Sweet Pea Stampers and good luck in the drawing!! This is really cute, Sharla! Love the papers and image! 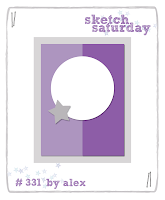 Thanks for joining us for Sketch Saturday this week!